sites.php + drush: A cautionary tale. The worst kind of error is one that doesn't look like an error. You may recall that I manage several Drupal multi-site installations and use Drush to move them through development to production. I thought I'd document a drush sql-sync gotcha that could cause a lot of damage, and hopefully save others from doing the same. So for development, or staging servers, you would set up as example.dev, or example.stg, then rename the directory when it gets promoted to live, right..? Yes, you would point your apache site file (or other web-server) to the relevant .dev/.stg/.com URL, but the directory should be sites/example.com or whatever tld extension your site uses) on every server. Drupal 7 introduced a sites.php file (in the sites folder) which transposes the site URL to the appropriate Drupal site folder. This means that the site folder can be migrated unchanged between stages – which allows you to use Drush, or Git, or some other tool to do the migration. In my case, a small typo in my sites.php file, resulted in the target site's database being replaced by that of the default site. Unfortunately, because drush did not produce an error message, everything appeared to go OK.
Obviously, as soon as I browsed to the site I could see that something was wrong. Nevertheless, there was quite a bit of head-scratching before the penny dropped... Fortunately, I had a recent backup. The -s (or --simulate) flag follows the drush command, while the -v (--verbose) follows the sql-sync command – otherwise the verbose output will be mostly about drush site-aliases. We want the info about the sql-sync part of the process. You can see that there is a system call to mysqldump (1) – two calls, actually – which writes to a temporary file (2). Then there is a call to mysql (3), which reads the temporary file produced by the first part of the process into the specified database (4). Make sure this is the correct database! If the entry in sites.php is incorrect or missing, then you might end up overwriting another site's database. If everything here looks OK, then you're good to go. Just run the command again without the -s flag. Anyway, this post has run a bit longer than I planned, but I hope it is useful to somebody. Make sure the URI in your alias file matches the 'name' part of the URI in the 'sites' array. 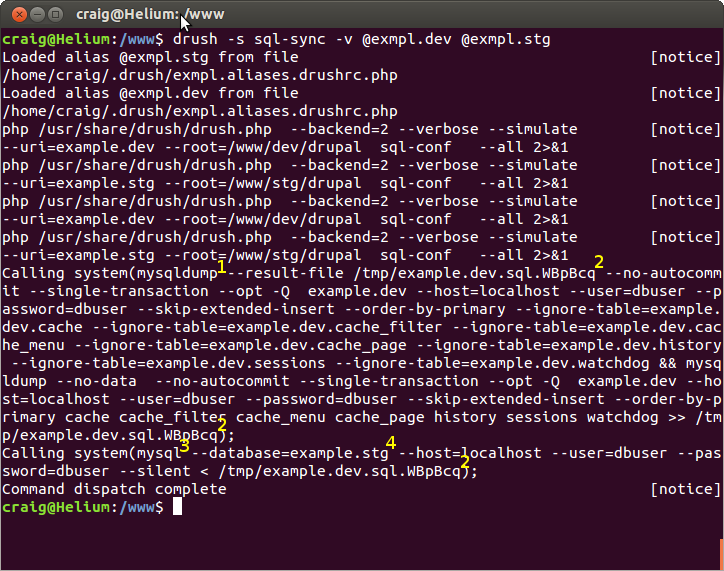 You can also easily check drush is using the correct database with the 'status' command. e.g.